Istinomer journalists being confronted by municipal police officers. Screenshot of Istinomer video. 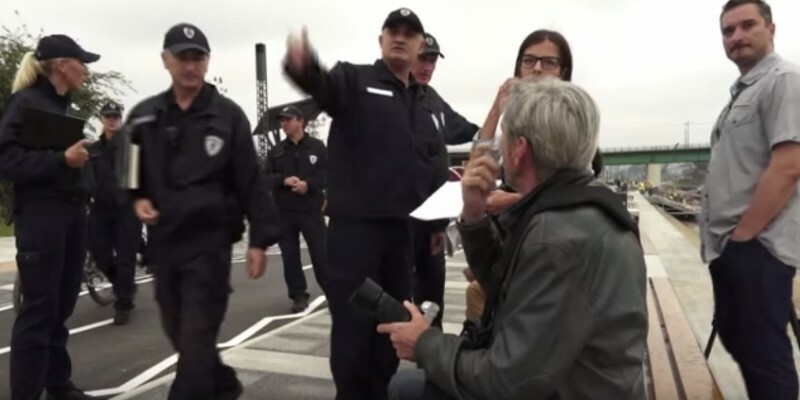 A group of journalists were stopped and harassed by police in Serbia on Friday, September 25 while they attempted to film a report on a controversial waterfront construction project that will house multiple luxury hotels and condominiums along Belgrade's Sava River. The video shows two police officers approaching the journalists. One of the journalists shows their press identification, along with their personal identification, explaining that they are preparing to film an interview on the site. The officers tell them that they are on a private construction site and must leave. The journalists point out that there are no signs indicating private property or a construction site. The officers agree that they cannot see one either. Minutes later, they are joined by three more municipal officers, who again ask the journalists to leave. One of the journalists says they are willing to leave if they are given a reason to leave the site. One of the officers then asks the cameraman filming to put away his gear, saying that the “site is unstable” and he has a “feeling the gear will be damaged.” When the cameraman says that the gear is fine where it is, the police officer repeats, “I have a feeling something is going to happen to it. Trust me.” Upon hearing this, journalist Vesna Radojević tells the officer to “leave our gear alone” and says she will call the regular state police. The municipal police officers then ask for everyone's identification and begin writing citations. At one point, the photographer in the group takes out his camera, puts a lens on it, and is then dragged away by police after refusing to put the camera away. Istinomer posted an uncut version of the video to YouTube and Facebook. This is not the first time independent journalists have run into trouble reporting on the Belgrade Waterfront project since it was first announced in 2014. The project, a joint undertaking worth 3.5 billion Euros between the Serbian government and Emirati investors, is a luxury construction project that aims to improve Belgrade's cityscape and economy by revitalizing a run-down stretch of land on the right bank of the Sava river. It includes high-end business and retail space, luxury apartments, eight hotels, a shopping mall and a 220-meter monumental tower. In a country with an average net salary of less than 500 dollars per month and in a city that is by no means among the most popular for luxury travelers or expats, many have wondered who will be purchasing the high-end real estate when it goes on sale in October 2015. Various local and international architects have drawn attention to the dangers and “impossible conditions” of building such a large-scale project on the riverbank. In March 2015, the Academy of Architecture of Serbia called for putting an “urgent stop” to the Belgrade Waterfront project, indicating several points where the project could present both structural and logistical dangers to the city, the river, and those residing in the buildings. Since analysis of profitability of this business model weren't made, nor were they subjected to verification of the Commission for Public Private Partnership, it is important to inform the public when the contract will be signed, whether there are controversial questions in negotiations and what are the risks and expenses that state will take over in this case. These questions regarding details of the tax-funded investment and the bidding procedures remain unanswered, and the state contract with the foreign investors has not been made public. As the delayed construction was finally set to begin in late September, journalists took a renewed interest in the project. This latest confrontation between Istinomer's journalists and municipal police will most likely only intensify journalists’ scrutiny of the project.